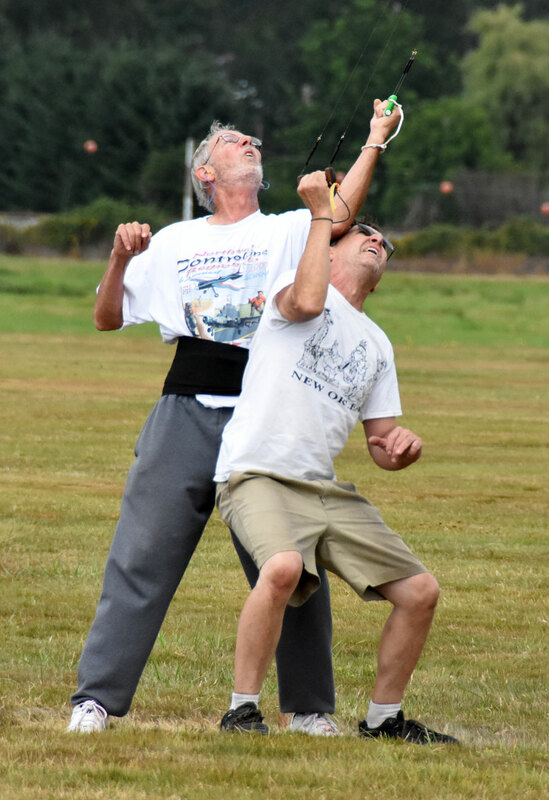 Championship match combat action at the 39th annual Bladder Grabber between Mike Rule (left) and Ron Colombo. Flying Lines photo. 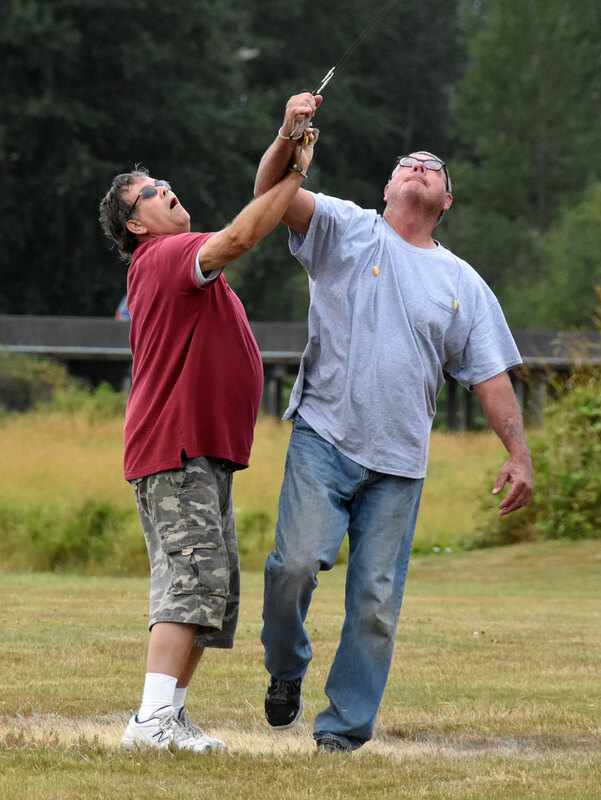 Seven-round Fast Combat tournament, Aug. 12-13, Snohomish, Wash.
Ron Colombo of Dearborn, Mich., made history by becoming the first flier to win the Bladder Grabber four times in a row. 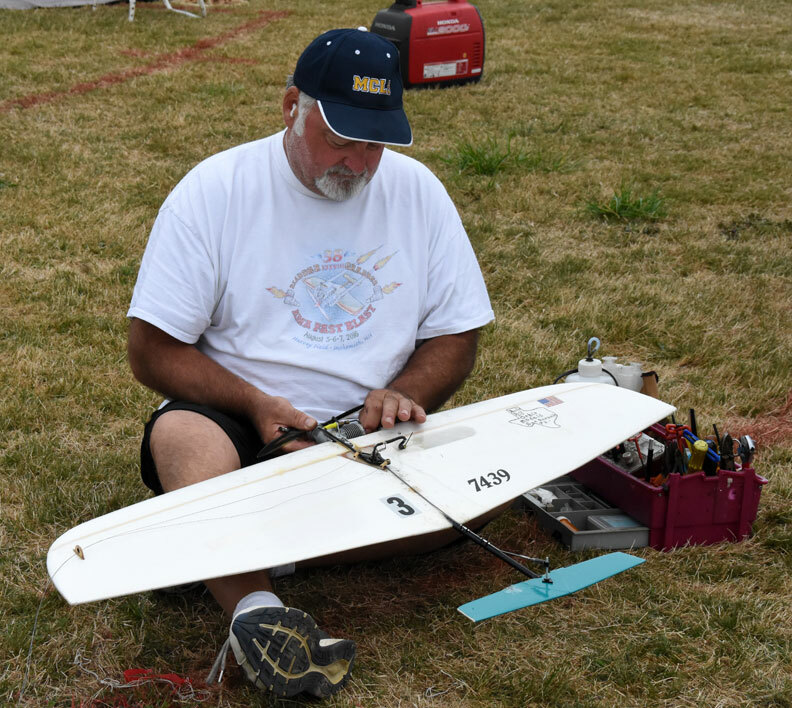 His win in the 2017 version of the nation's most prestigious and AMA Fast Combat tournament followed up his fourth straight win in the U.S. National championships in July. Colombo made it into the semifinals with a score of 5 wins and 2 losses in the preliminary seven-round matrix. He then beat Bill Maywald (6-1 in the preliminaries) to advance to the championship match. His opponent there was Mike Rule of Emmett, Idaho, who was 7-0 in the preliminary rounds and beat Don Jensen (5-2 in the preliminaries) in the other semifinal. 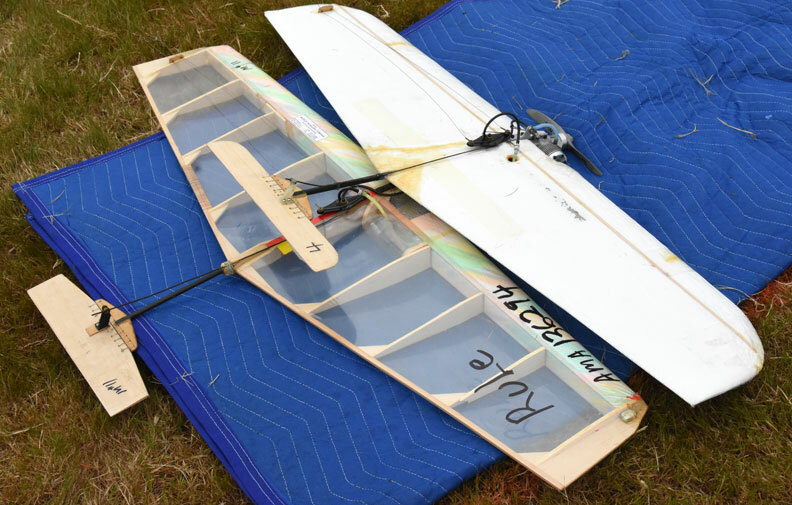 Third place was settled in a flyoff between Jensen and Maywald, with Maywald coming out the winner. Fifth place went to Gene Pape, who tied with two other fliers with a 5-2 record in the preliminaries but was eliminated from the semifinals by head-to-head results. Colombo's reward was the $1,200 top prize. The top four contestants in both Fast and High-Performance 1/2-A Combat took home cash prizes along with handsome Bladder Grabber mugs and shirts. The second-, third- and fourt-place finishers in Fast also received Fora .36 engines donated by Colombo. There	was	also	a "booby prize" awarded to two-time past Bladder Grabber champion Mel Lyne, who went 0-7 in the preliminary rounds. 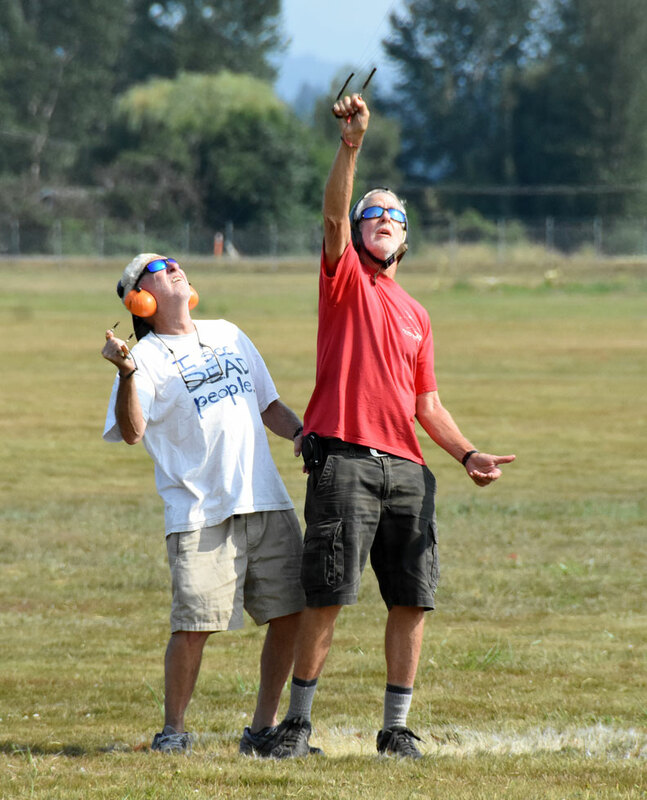 A special award went to Travis Machen as the top junior contestant; Travis flew in the 1/2-A Grabber. 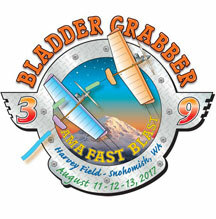 The 39th running of the Grabber was one of the best-attended in recent years, with 18 entrants in Fast and 20 in 1/2-A. 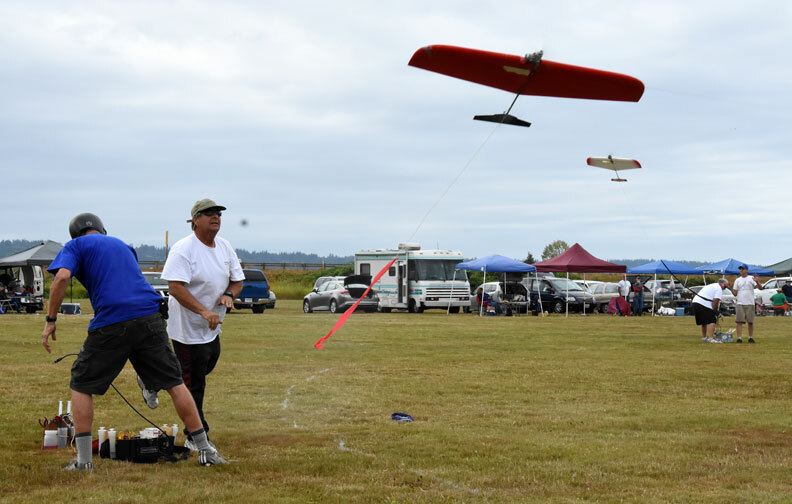 Pete Athans of Pine Mountain Club, Calif., won High-Performance 1/2-A Combat, which was run in a double-elimination format, taking the championship in the final match over John Thompson of Eugene, Ore. 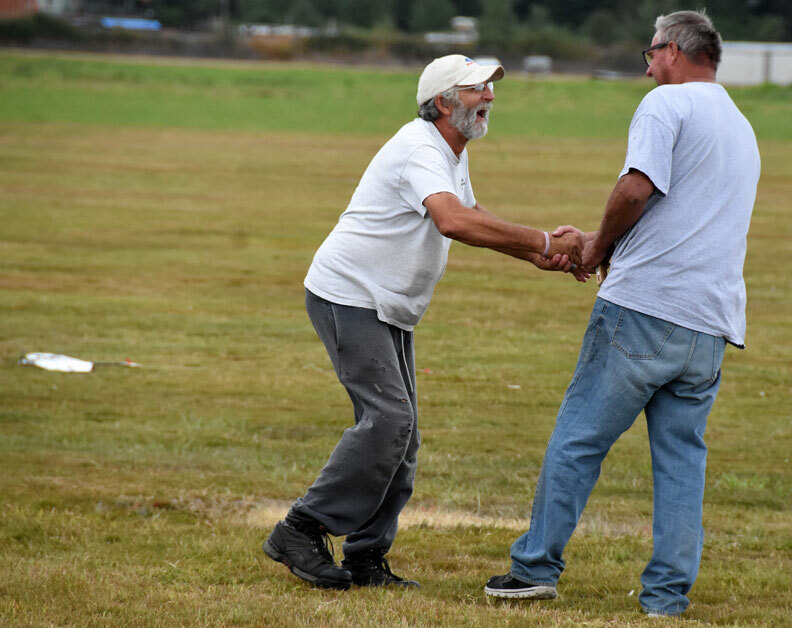 It was another smoothly run contest under the management of Jeff Rein, who was the director and lead judge for the 20th consecutive year, assisted by Tony Huber, Buzz Wilson, Mike Moreland and Don McKay, among other volunteers. The contest provided lunch for the contestants on Saturday and Sunday. Weather was good on Friday and Saturday, with temperatures in the 80s; there was some early rain on Sunday but everything dried out as the day went along and temps reached into the mid-70s. 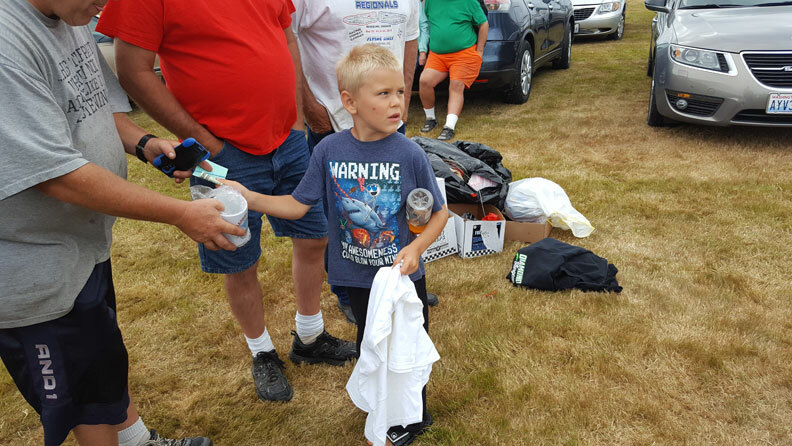 CD Rein indicated that plans already are under way for the 40th annual Gladder Grabber in 2018. The Fast Combat winners' "podium." 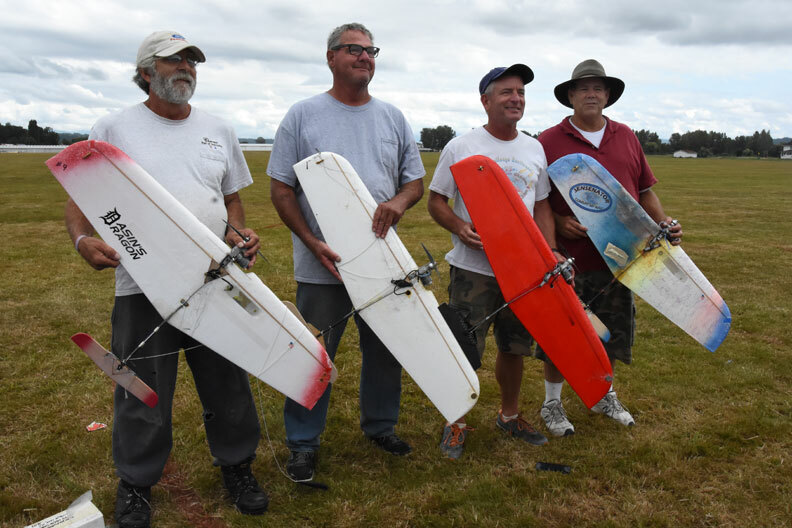 From left, in order of finish, Ron Colombo, Mike Rule, Bill Maywald and Don Jensen. Flying Lines photo. 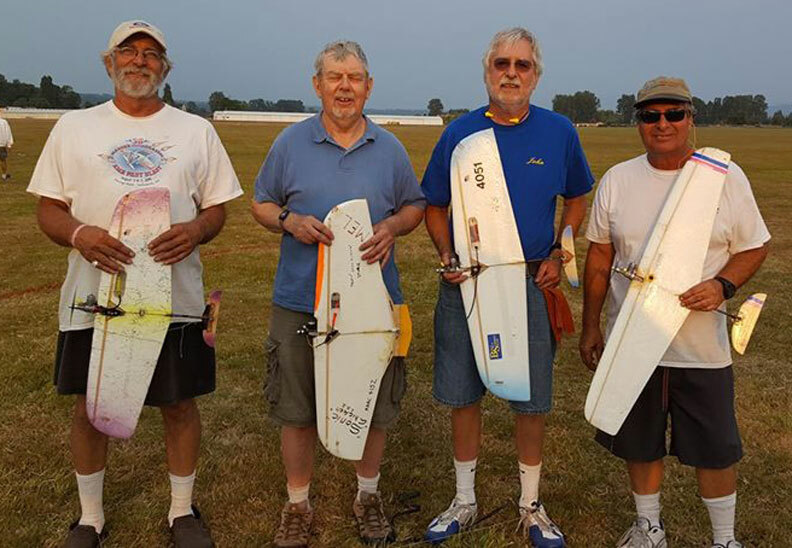 Top four in the High-Performance 1/2-A Combat event, from right in order of finish, Pete Athans, John Thompson, Mel Lyne and Ron Colombo. Gene Pape photo. 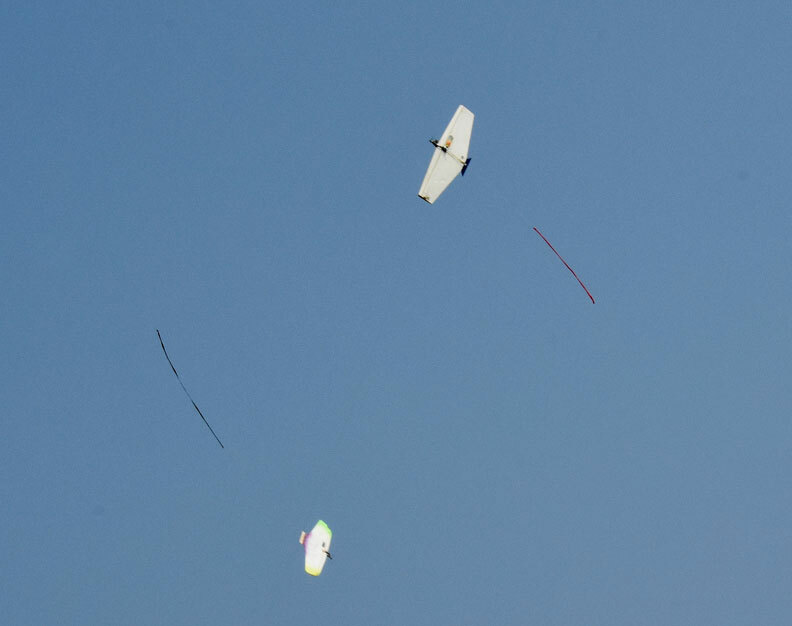 Almost simultaneous lauch in a Fast semifinal between Bill Maywald (red plane) and Ron Colombo (white plane). Maywald's starter Chuck Rudner steps aside as Pete Athans launches. In the background, Mike Evans steps aside as Lee Letchworth launches Colombo's plane. Flying Lines photo. 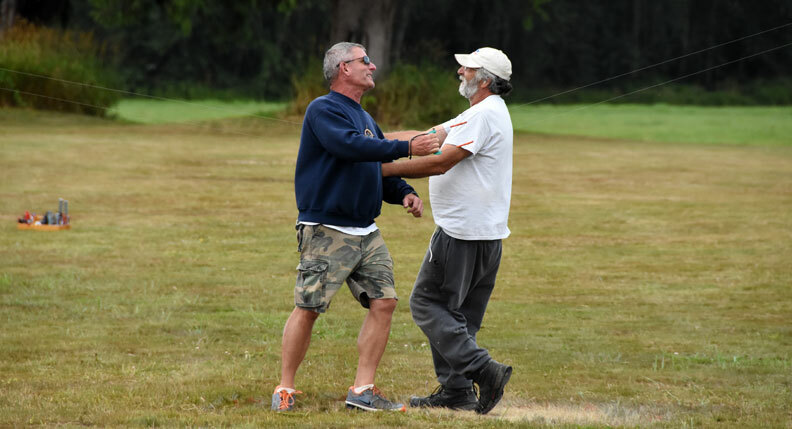 Bill Maywald (left) congratulates Ron Colombo after Colombo's win in the semifinal. Flying Lines photo. 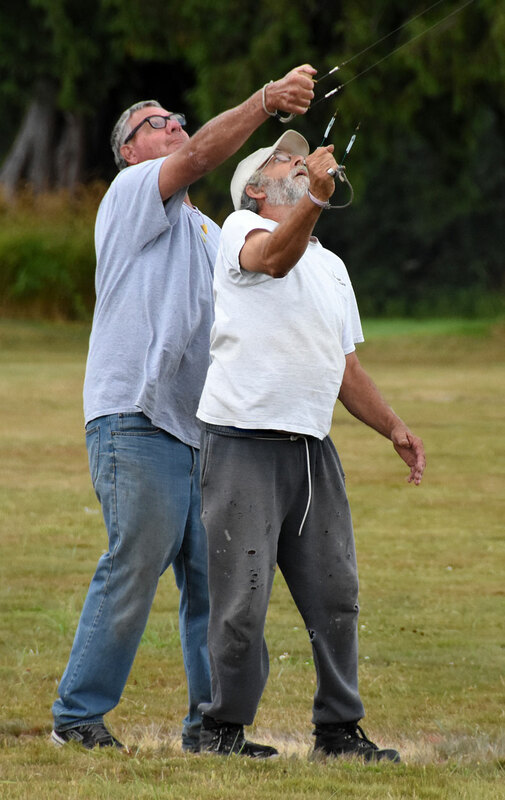 Don Jensen (left) and Mike Rule battle it out in the other semifinal. Flying Lines photo. Ron Colombo (left) is congratulated by Mike Rule after the championship match. Flying Lines photo. Intense action in the center between Jeff Rein (left) and Lee Letchworth during a Fast match. Flying Lines photo. 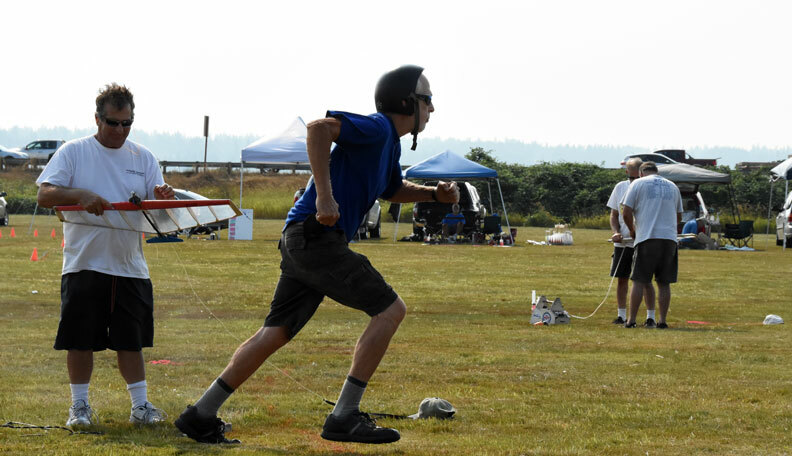 Starter John Knoppi watches Jeff Rein's Fast plane take off after launch by Mike Rule, as judges Mike Moreland (far left) and Buzz Wilson follow the action. Flying Lines photo. 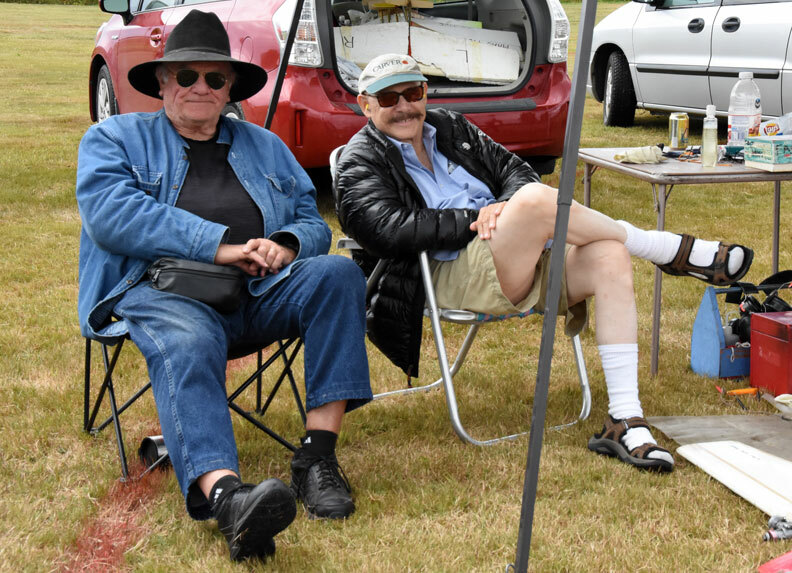 On hand to watch the action were Combat legends Norm McFadden (left) and Bob Carver. Flying Lines photo. Two Fast Combat planes approach a close enounter. Flying Lines photo. Doss Porter (left) and Greg Machen at work in a preliminary Fast match. Flying Lines photo. 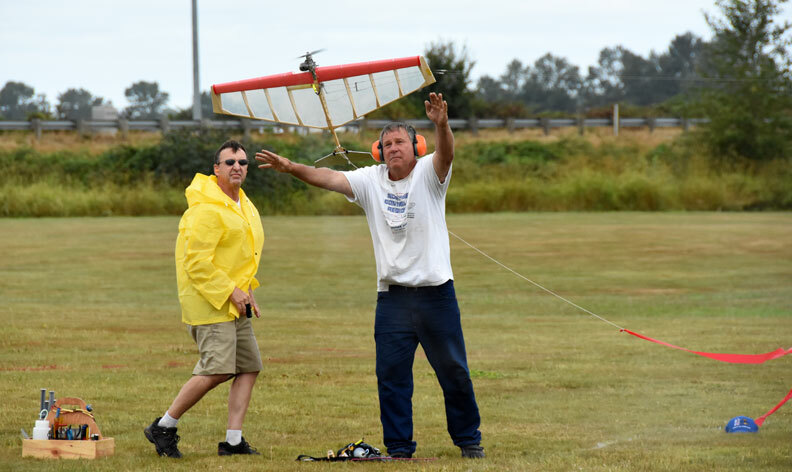 Robert Smith launches Greg Machen's plane after Lee Letchworth's start. Flying Lines photo. 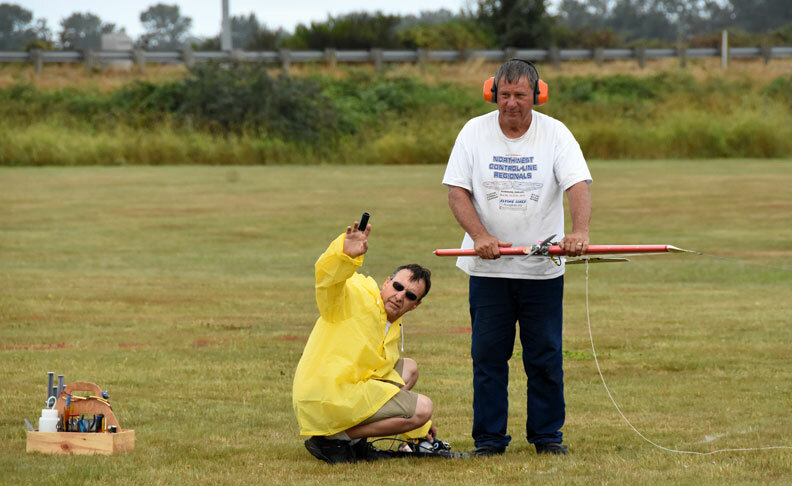 Lee Letchworth signals judges that he is ready for the 15-second countdown, as launcher Robert Smith holds Machen's plane. Flying Lines photo. 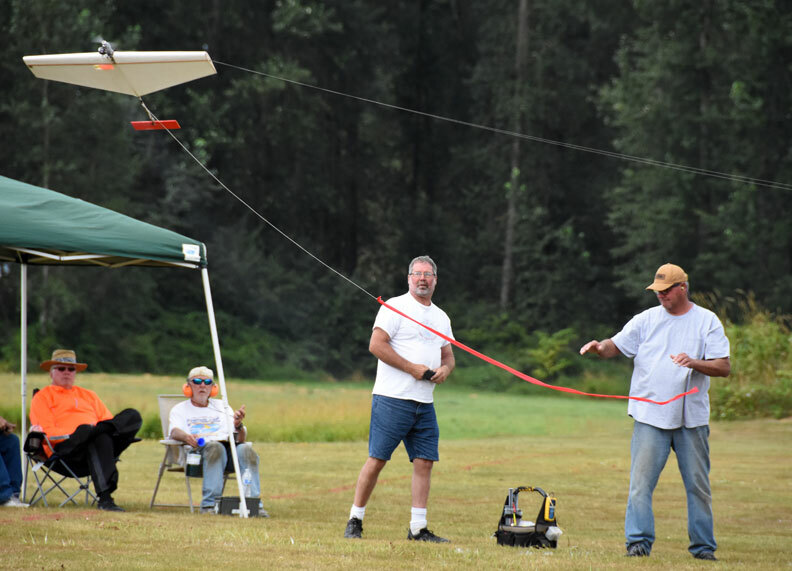 Buzz Wilson (left) and Chuck Rudner fly in a Fast preliminary match. Flying Lines photo. Fast Combat involves a lot of preparation in the pits. 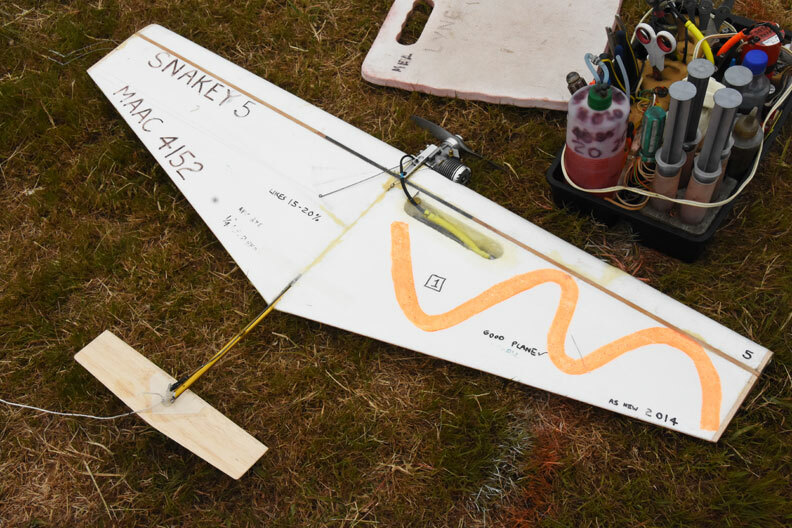 Here, Mike Evans gets a plane ready for action. Flying Lines photo. 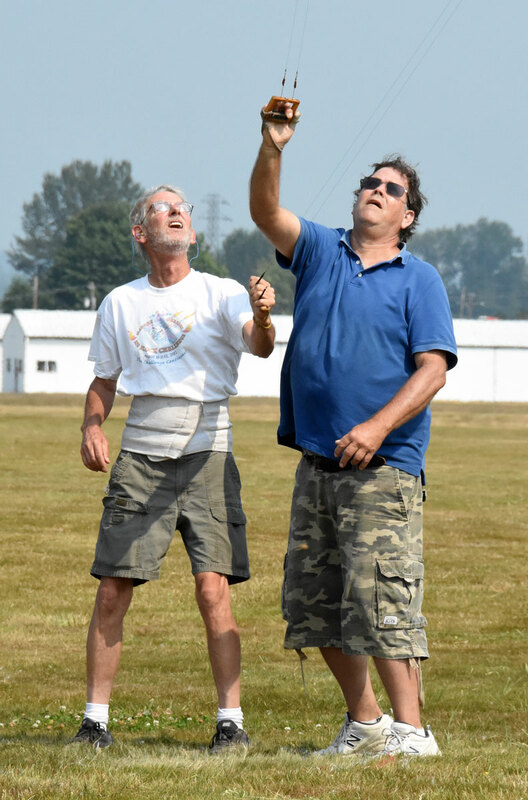 Robert Smith (left) and Chuck Rudner in the aftermath of a 1/2-A line tangle. Whose lines are whose and where are the planes? Flying Lines photo. 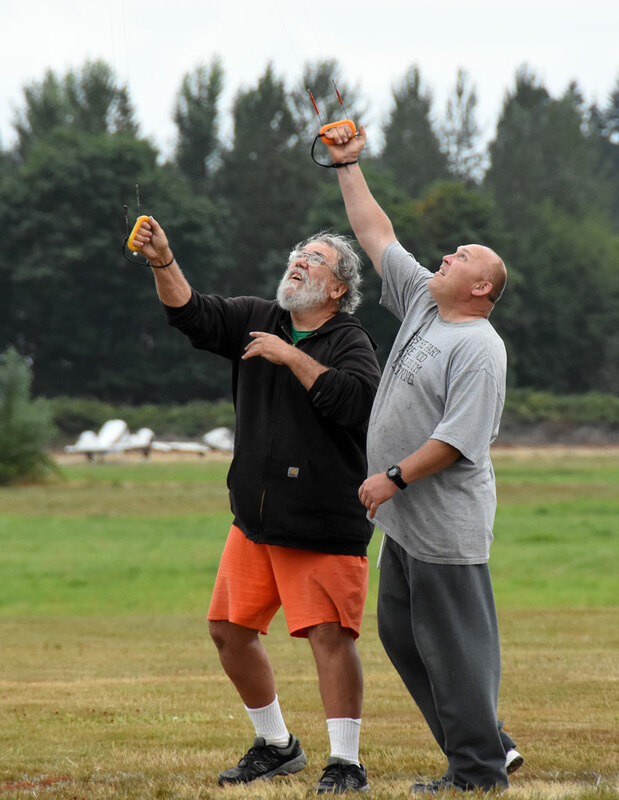 In 1/2-A, pilots started their own engines; here, Chuck Rudner sprints for the handle as launcher Pete Athans holds the plane. In the background, Robert Smith is starting his engine as Jim Green holds. Flying Lines photo. 1/2-A Combat action. Flying Lines photo. 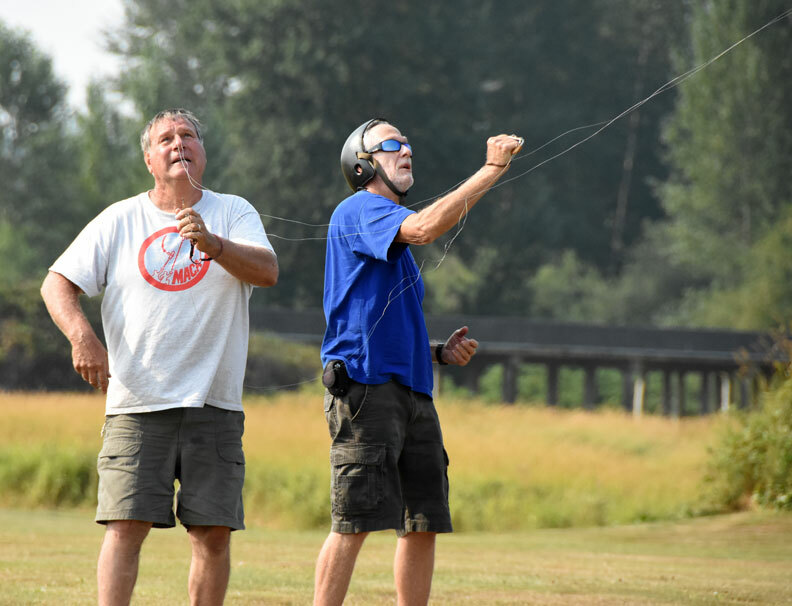 Jeff Rein (left) and Don Jensen fly a 1/2-A match. Flying Lines photo. 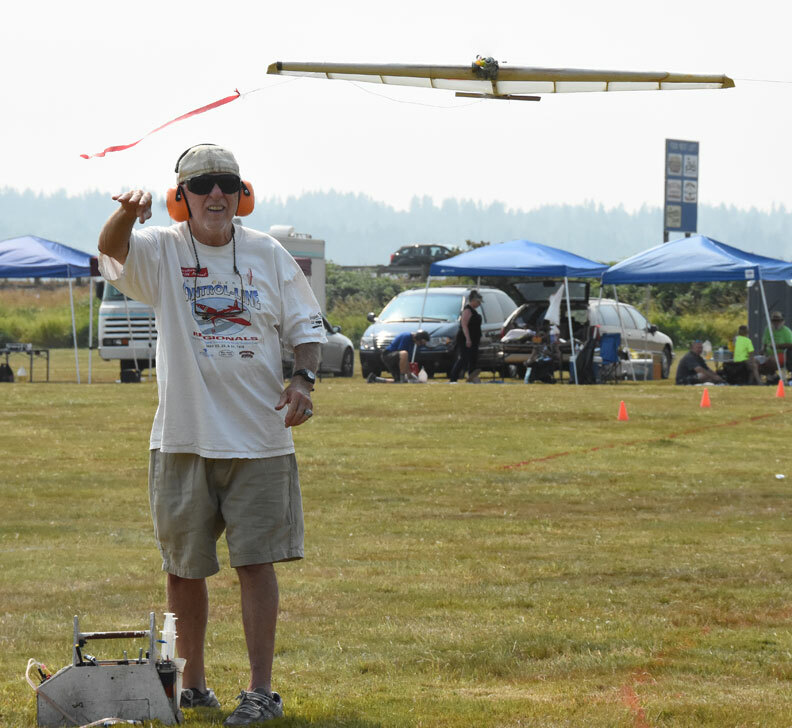 Buzz Wilson launches Robert Smith's 1/2-A plane. Flying Lines photo. Doss Porter is always well-dressed in green and orange clothes that match his airplane decorations. Flying Lines photo. Travis Machen gets his prize as top junior in the 1/2-A competition. Gene Pape photo. 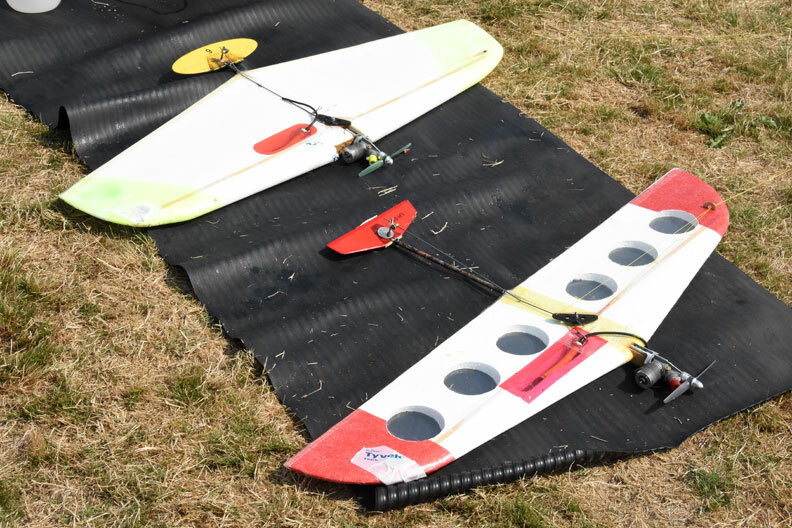 Fast planes lined up for action on Saturday morning. Flying Lines photo. 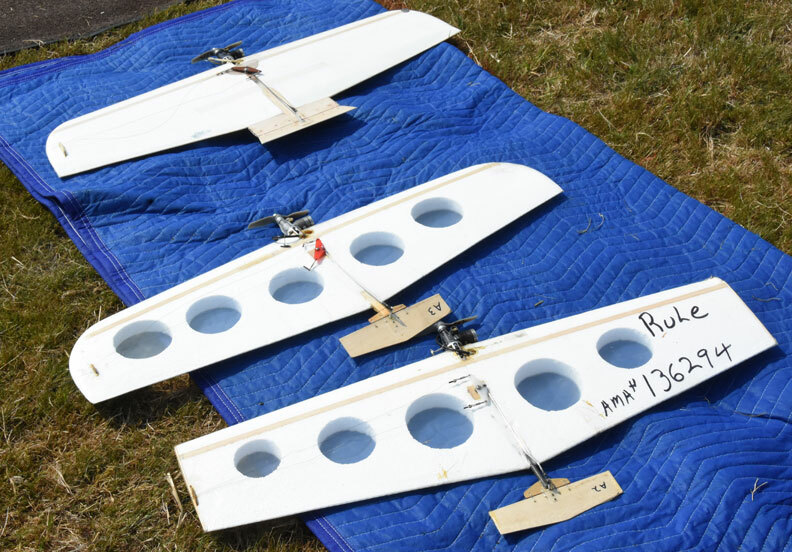 Beaver State Combat Team planes ready for action: Gene Pape's white Underdog, John Thompson's two Yuvenko-built planes. Flying Lines photo. 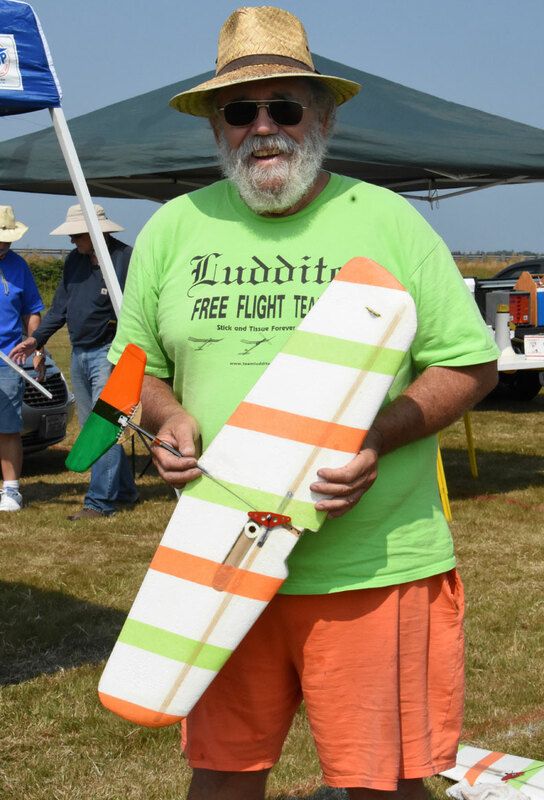 Mel Lyne names his planes. Flying Lines photo. 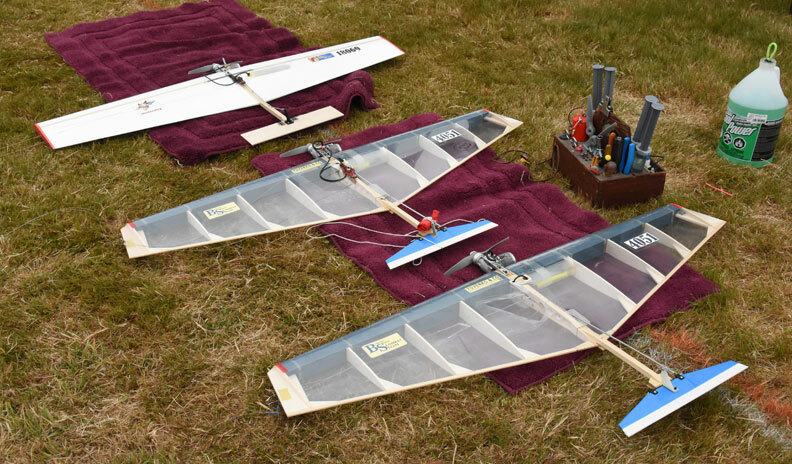 Two Mike Rule planes ready for action. Flying Lines photo. Two brand new planes by Jeff Rein. Flying Lines photo. 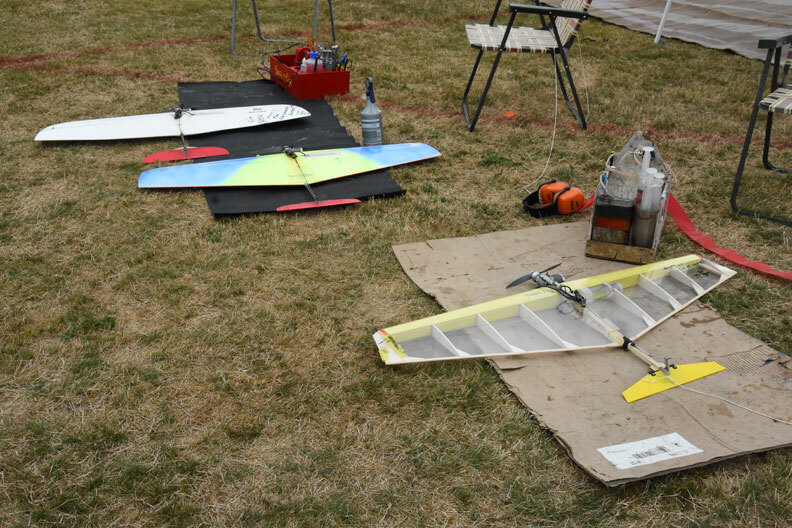 Buzz Wilson's planes (center) were among the most colorful. Flying Lines photo. 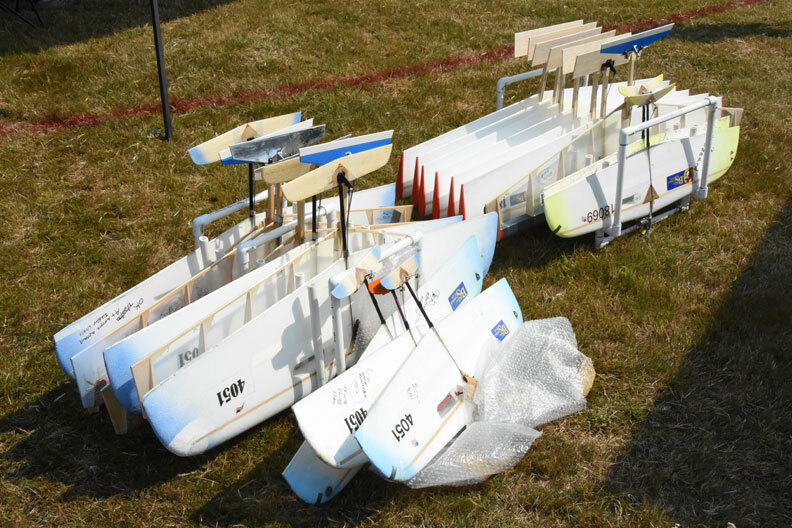 Oregon's Beaver State Combat Team fleet before the contest (nothing damaged yet). Flying Lines photo. All of the Fast planes and many of the 1/2-As had flyaway shutoffs. This one by Bill Maywald is one of the best. Engine is a Nelson .36, standard on most Fast planes. Flying Lines photo. Mike Rule's 1/12-A fleet. Flying Lines photo. 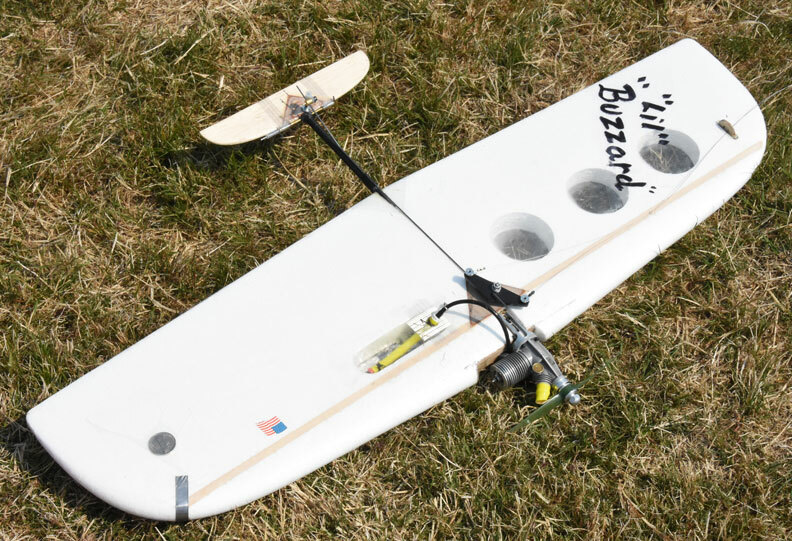 Many of the planes on the field were built by Jeff Dawson, including this Lil' Buzzard 1/2-A. Flying Lines photo. 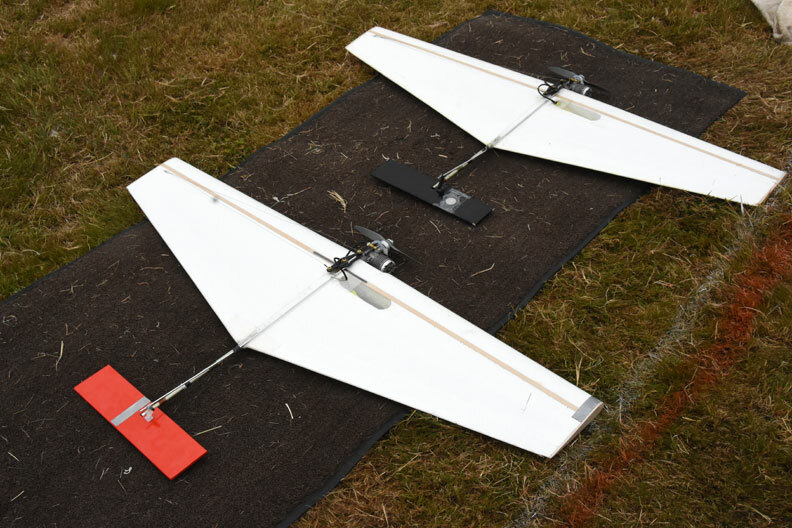 Two more 1/2-A planes. Engines were Cyclon, Fora or GRS. 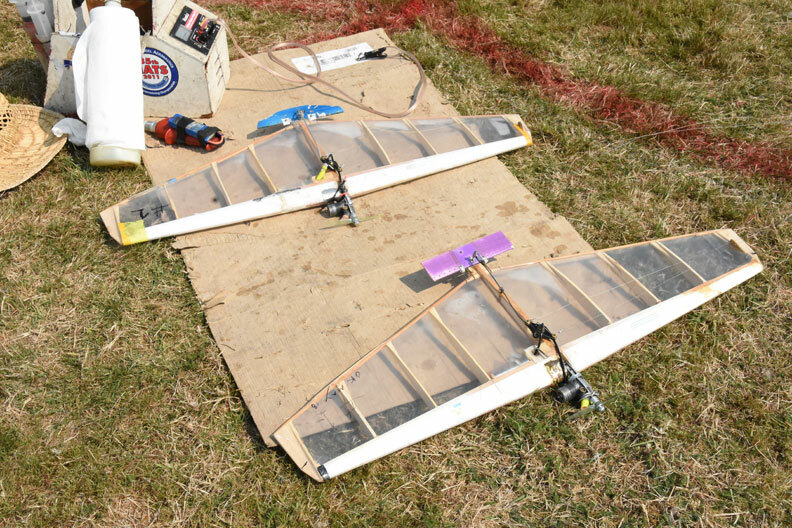 These planes are a variation of the Sonic Chicken (left) and Lite Hawk. Flying Lines photo. 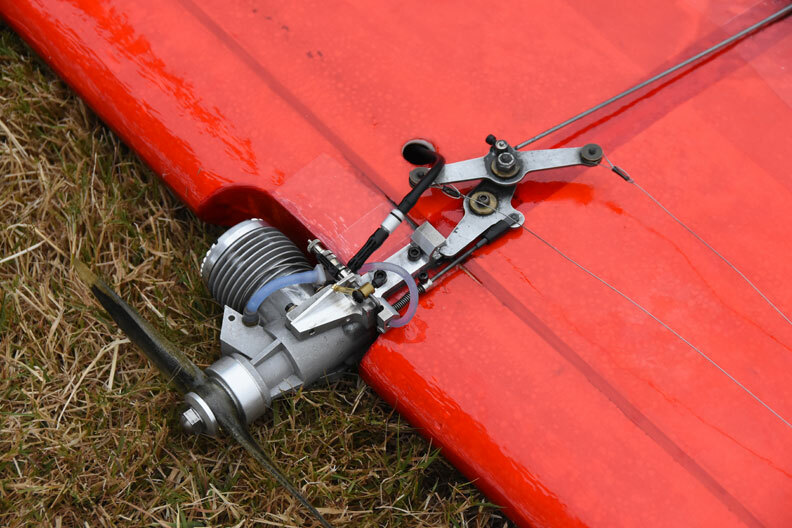 These two 1/2-A planes are equipped with H&R 1/2-A shutoffs. Flying Lines photo.